The development of a retail destination which promises to deliver the “finest quintessential retail experience” is now underway in Harrogate. Yorkshire business partners Graham Watson and Jason Clay recently purchased the trading companies Harrogate Antique and Auction Rooms Ltd and Brookside Nurseries Ltd on Leeds Road, Harrogate, with the intention of creating a “retail destination” for antiques, gardening products and home interiors. Shulmans LLP solicitors’ corporate lawyer Marcus Armstrong, an industry-acknowledged expert in retail acquisitions, acted for the buyer’s acquisition vehicle, Crimple Hall Ltd in connection with the purchases. 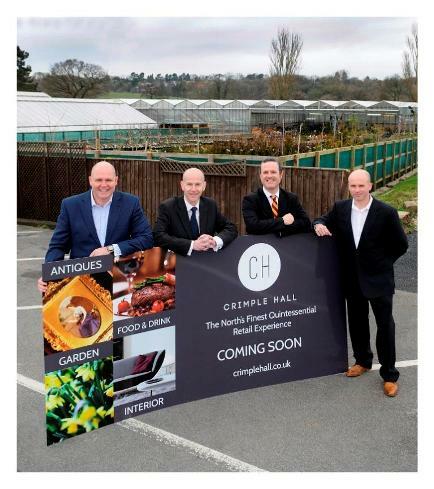 Entrepreneur Graham and property developer Jason are now busy developing the two businesses, currently on neighbouring sites, into one retail business under the new name of “Crimple Hall” which will add greatly to the retail facilities already available in the hugely popular spa town. “Our research showed that interest in the two businesses had been waning steadily, but since the acquisitions we’ve already given both the garden centre and antiques centre a new lease of life and that has been demonstrated by the increase in customers. “This has been achieved by a variety of measures, including increasing stall occupancy in the antique centre by a third. Currently we now have 48 stalls holders selling everything from antique jewellery to ornaments, fine art and furniture, plus an outdoor reclamation area selling used items such as benches, tubs and wrought iron gates. From June 1 we will also be holding monthly live antique auctions. “We have plenty more plans in the pipeline. The first phase of the development plans, due for completion by May 1, will include a new cafe/bistro, a farm shop and a wide variety of gift outlets within the garden centre, as well improved entrances, signage and parking to the site off Leeds Road, complete with Crimple Hall branding. The farm shop will sell carefully selected local produce including fresh fruit and vegetables, homemade bread, cakes, preserves and condiments and there will also be a butchers and a deli counter. The new cafe/bistro, which will be double the size of the existing cafe, will serve freshly prepared meals and light bites, again using local produce from the farm shop. In addition it will boast a new outside seating area with views over Crimple Valley. The second phase of the Crimple Hall development, aimed for completion by November 2015, will include replacing the existing antiques centre with a new rural-style building which will hold 85 antiques stalls, as well as Italian furniture specialists Harrogate Interiors, which is currently located in a separate building on the site. “People already travel from considerable distances to visit the antiques centre but we are confident we will attract even more people to not just the centre, but Harrogate itself, by making it the largest antique centre in the North. “We also plan to join the garden centre and antiques centre with a ‘Victorian Street’ where we would hold a variety of regular entertainment. “We’d even like to host events such as Christmas markets and family barbecues in the future. “Graham and Jason’s vision for Crimple Hall is an exciting one, and Shulmans has been delighted to work alongside such an ambitious duo.